Welcome - you're at the Dyfi Valley section of my Machynlleth and Dyfi Valley website. If you Enter via my Home Page, you'll find a large section dedicated to Machynlleth and a comprehensive site index. The main entry point to the Dyfi Valley pages is via the "Explore Valley" button above, which brings up interactive maps with accompanying notes. The other buttons take you to single theme topics. The valley is, unsurprisingly, full of history, myths and legends, and sometimes it's difficult to tell fact from fantasy. The relatively recent historical facts of the Machynlleth area were well documented by local author, the late David Wyn Davies, but the pre-history and legends of the valley don't seem to have been brought together by anyone. So my notes are merely intended as a taster, with scant details and links to Web Sites which contain far more information - and it's up to you whether you prefer flowery words woven into mystical tales of wonder, or bald facts which debunk the legends and inevitably leave you feeling disappointed! 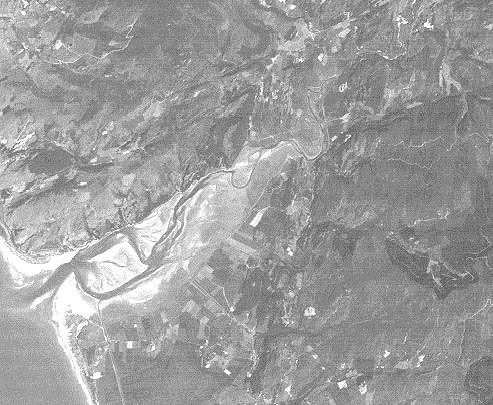 Satellite image of the Dyfi Valley. 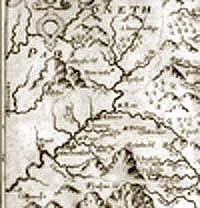 Mid-1600s Saxton Map of the Dyfi Valley. Click here to see larger version. Click here to see larger/better definition version.